In July 1991, this spanner was used to tighten the final fastening on Burnaston’s steel framework, completing the structural phase of the plant’s construction. The spanner has been kept as a reminder of the tremendous amount of work that goes into the making of every Toyota – without the hard work of the construction workers, TMUK wouldn’t have its fantastic production facility at Burnaston. 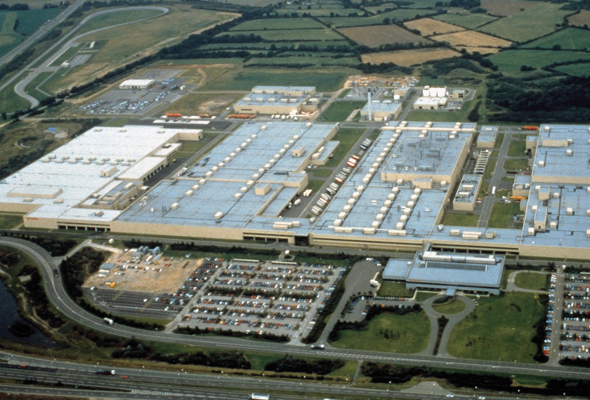 Toyota announced its intention to build its first European manufacturing facility in 1989, with construction at Burnaston beginning in June 1990. By the time production started in December 1992, Toyota’s initial investment in its UK manufacturing bases at Burnaston and Deeside ran to £840 million. Toyota’s investment wasn’t simply financial either – over 100 man-years of training took place across three continents to ensure that TMUK’s members were equipped with the necessary skills to meet Toyota’s exacting quality standards. Toyota has continued to invest heavily in its UK manufacturing operations – to date, a total of £2.5 billion – and establish TMUK as one of its leading global production operations. For instance, in 2010 TMUK’s Deeside plant became the first facility outside of Japan to produce one of Toyota’s world-leading hybrid powerplants, enabling Burnaston to begin production of the Auris Hybrid. TMUK’s plants have also been flagships for Toyota’s sustainable initiatives, attaining internationally recognised accreditation for environmental management and achieving the distinction of sending zero waste to landfill through measures to re-use, recycle and recover waste materials – an ambition realised two years ahead of its target date. During 2016 TMUK produced its four-millionth vehicle – an Auris Hybrid – and every one of those Toyotas stands as a testament to the hard work and dedication of TMUK’s workforce over the past 25 years.